You'll hear Sen. Kirsten Gillibrand (D-NY) rejecting President Trump's border security proposals these days, but about a decade ago, she was singing a different tune. During her 2008 campaign for Congress, Gillibrand bragged in a mailer how she had called for the deportations of illegal immigrants. The ad also highlighted her opposition to illegals getting drivers licenses, a boost in the number of border agents, fines on companies who hired illegal immigrants, expanding the E-Verify programs for employers, and other now-unheard-of policy stances from a Democrat. CNN's Jake Tapper asked her to please explain her change of heart. 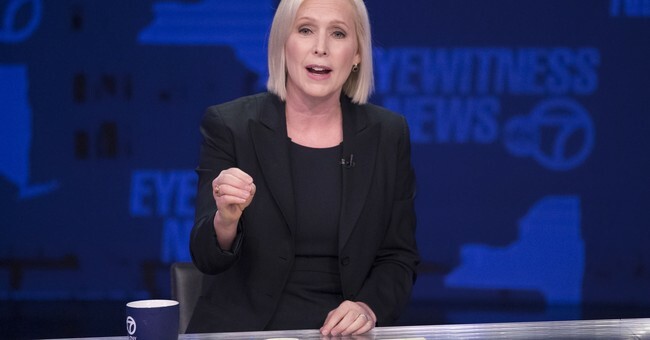 Considering that Gillibrand is now in the business of calling Trump's policies "racist," he wondered whether those policies were racist when she supported them. NEW: On @CNNSotu, Kirsten Gillibrand was asked about the mailer I reported on her office sent out bragging about her votes to increase and speed up deportations of undocumented immigrants. "They certainly weren't empathetic and they were not kind," Gillibrand said of her past comments. "And I did not think about suffering in other people's lives." Since then, she explained, she's tried to correct her approach to immigration by traveling throughout New York to meet with families affected by such policies. She also met with immigration advocates and afterwards the senator "realized" that the things she had said were unacceptable. She said from now on she'd "fight" for families who are suffering in her state. I predict Gillibrand will have to answer these questions about her flip-flopping stance on immigration again as her campaign for president gets underway.